GRAFENWOEHR, Germany — Seventy new townhouses on Rose and Tower Barracks will be ready for families to move in by late May. The three- and four-bedroom townhouses, for accompanied service members in the grades of E1 through E6, all have two-and-a half bathrooms, an upstairs laundry room, heated floors, a garage, storage room, patio and fenced-in yard. The units also combine several environmentally friendly technologies that make them easier and less expensive to run, Hoesl said. For example, automatic ventilation systems maintain humidity levels that reduce the potential for mold. The heat recovered from the ventilation systems, in combination with geothermal and solar heating, provides all the heating for the houses. 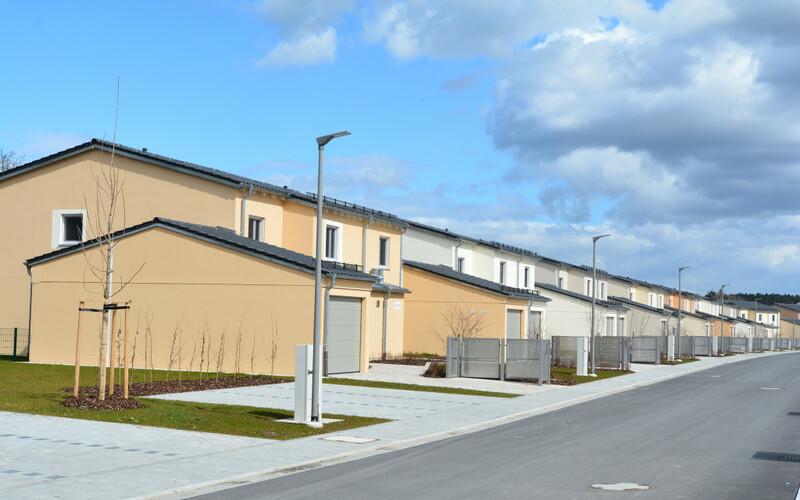 “These are the first houses in USAG Bavaria using only renewable energy. We’re not supplementing with heat from standard energy sources,” Hoesl said. The 20 units on Rose Barracks are located at the end of Green Mountain Road. The 50 units on Tower Barracks are located between gate 1 and gate 3, along a new road that has not yet been named. The Tower Barracks housing area also includes a playground. Two units, one on Tower Barracks and one on Rose Barracks, will be used as models for prospective tenants to view, according to Kennith Carter, chief of the garrison’s Housing Division. “When new families are offered a townhouse, they will be able to go out and look at the model. AAFES was really helpful in furnishing the models, so that families can envision the house with furniture,” Carter said. The construction of these townhouses, started in August 2013 and completed in January 2016, is phase one of a three-phase plan that will enable the garrison to replace private leased rental properties in the housing inventory. “These let us get rid of smaller, older houses, some located as far away as Weiden, and offer families larger, up-to-date housing that is more conveniently located, especially for families with just one car,” said garrison commander Col. Mark Colbrook. Phase two, which will provide up to 29 units on Rose Barracks, is in the design stage. Construction is projected to start in late fall 2016.